How to make a roofing pie right? In the building there are various vocabulary terms that are incomprehensible to people who are not versed in the subject. One is so named as "roofing pie". 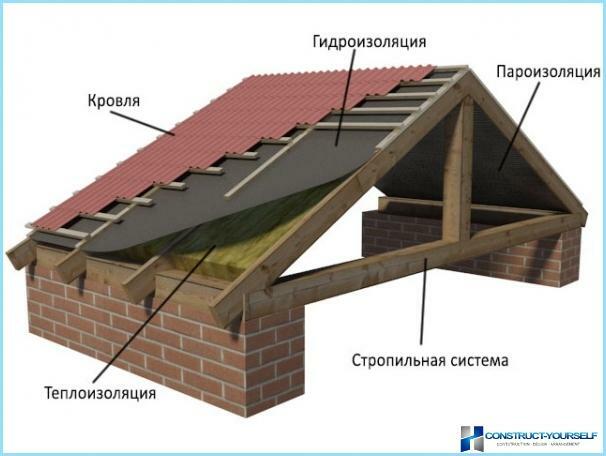 Roof pie - several layers of material, andstructures used in the construction of the roof. Therefore, it is compared with a pie - multilayered and complicated to prepare. This is a whole system with its nuances, secrets and rules. Nowadays roofing pie performs many more functions than ever before; from that of its setting is one of the most difficult points in the construction of the house. Of what is this "pie"? The roof also includes decorative cakeelements (pinwheels), gutters, drainage systems and other equipment roof. 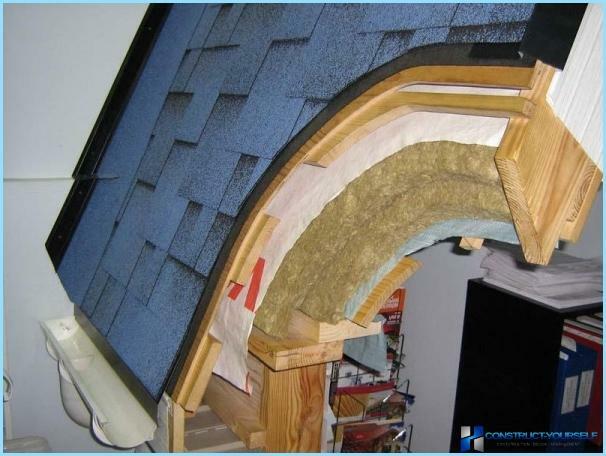 If an internal trim all clear (depends on the interior), then deal with insulation and other elements of the "layers". As we know from physics lessons, under the roofgoing to the most heat and water vapor (that is water), so attention to the isolation here should be given as much as possible. Before installing the main element - the heater - it is necessary to pave the insulation film to prevent moisture passed on in roofing pie. But in case it passes through the bed, a heater must not accumulate it in itself, and skip forward. Thus, a heater must have a high vapor permeability do not deform and be fire resistant. Its thickness should be from 150 to 200 mm. For roofs are more suited slabs of stone, glass fiber or mineral wool. Important: Insulation should be installed only afterhow to design the humidity of wooden elements of roof pie will be equal to or less than 18%. Otherwise, the moisture from the wood fall into the insulation, and can not leave it because of the waterproofing layer. Insulation should always be dry. The blue layer - vapor barrier; Yellow - a heater. 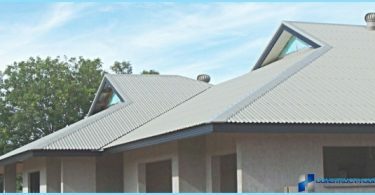 If your roofing material iscorrugated sheet, in any case, a natural ventilation. Complete roof soft type has a special ventilated skate; the upper and lower ventilation gaps associated with the environment by means of roof ventilators. Roofs against system icing use heating cables, temperature sensors and other equipment. They can not only hold the roof and gutters and around the windows of the upper floors. Waterproofing condensate film (also required clearances; do not let the steam suitable for metal and evroshifer). The thickness of the roof of the pie should be within30-35 centimeters, with this in mind and should comply with the design of rafters. They should be selected for softwood humidity not higher than 22%; treat it with preservatives and fire retardants. On the rafters set kontrobreshetku, and then mount it under-roof waterproofing. The resulting gap will provide additional ventilation. By kontrobreshetke mounted crate of timber or solid flooring DSP, OSB or other such materials. The solid roof is put on the crate, but the soft approach of the second option. When using shingles can notlay a layer of waterproofing: bitumen itself is waterproof. The film will be needed only at the corners, eaves and joints, and it should not be laid under the crate, and already before the actual installation of the roof. Soft shingles involves the use of the lining - polypropylene film that performs waterproofing function. 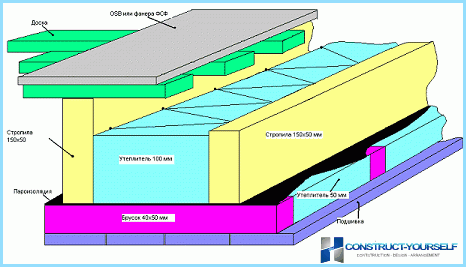 As for metal tiles, hereIt requires sound insulation layer. Any blows of such material, whether it be rain or a bird, give an unpleasant sound in the room, so to pave the layer of very highly recommended. From the above it can be concluded that for different types of roofing need different "recipes" roofing pie. Waterproofing, as has been said, is not necessary. To prevent an increase in the amount of insulation and the further consequences of using the "grid" of the nylon cord. The scheme is called a wind insulation waterproofing. As you can see, there is a fourth layer of insulation that does not allow to form cold bridges. Recommended insulation material - basalt. This variant of the pie can be used for metal tiles, while the plywood should be replaced by crate of timber. 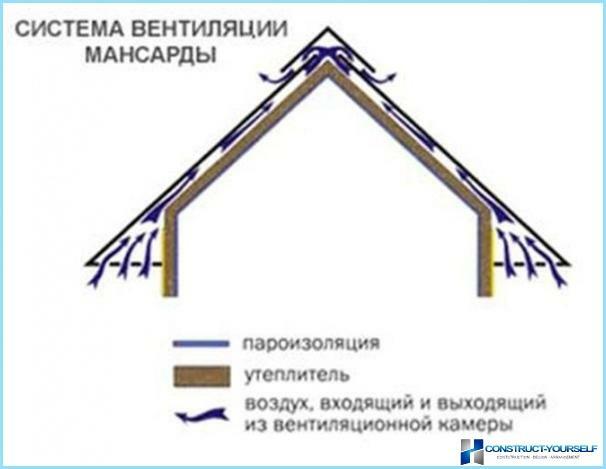 Waterproofing secure the overlapping parallel to the eaves (if the roof angle of more than 20 degrees). RememberNever skimp on materials roofingcake, because of this, even the life of the house depends. The high-quality material and better work, the less likely that the roof begins to leak, heat flow, will be formed of ice, or what will happen collapse. High-quality materials and skilledworkers will leave a lot of money. But experience shows that frequent repairs or even replacement of the roof (up to the end of its estimated useful life) will cost even more. If you are not sure, then it is better to entrust such a responsible job to professionals. Roofing pie in the understanding of the common manIt can be called the complex "layers" that are included in the concept of "roof" of the house. 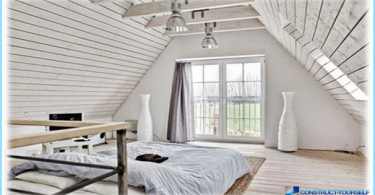 Materials that provide comfortable accommodation in the attic rooms, or else not "flowing" attic, stacked in layers, so they are compared with a layer cake. The proper execution of roofing piedependent, even the life of the house, so to save on materials or work - is not the best idea. 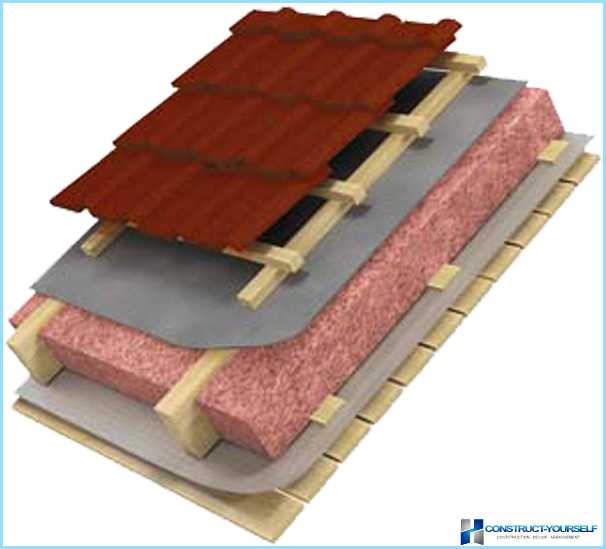 The roof protects the house from the environment, so the system should be given special attention. Without all the necessary elements of any systemIt will not work, so each layer of the cake is very important. One of the rules of compliance with the heater is in a dry state. This will help waterproofing and vapor barrier. For the removal of moisture and temperature conditions made air gaps. special thermal equipment can even buy in the fight against icing. Do not forget the gutters and snow stop. Roof pie will provide not only a warm winterand cool summer mansard room, but also protect you from unpleasant sounds due to the shock of the roofing material. It is the second most important stage of construction of the house, so he has to pay a respective amount of money and the amount of time.